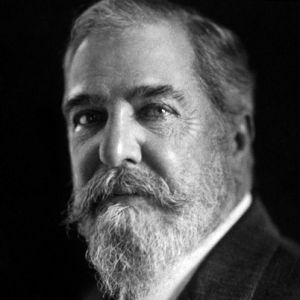 Born in New York City, Louis Comfort Tiffany was the oldest son of Charles Lewis Tiffany, founder of Tiffany & Co. in 1837. Raised in an atmosphere of tremendous wealth and expensive taste, Louis Comfort Tiffany was considered a Renaissance man during the Gilded Age. He decided not to join his father’s company and studied fine arts instead. Tiffany is most known for making his mark in the decorative arts. He worked in many mediums, including furniture, metalwork, textiles, pottery, enamels, jewelry, and book design. In the late 1870s, he became intrigued by the decorative possibilities of glass and used it throughout his career. Tiffany was a notable contributor to the Aesthetic Movement, which elevated the decorative arts to a new, higher status. He used historical and biblical sources for inspiration and was drawn to the arts of China, Japan, ancient Greece, Egypt, Venice, India, and Islamic countries. Like his contemporary Gustav Stickley, Tiffany was also influenced by the practices of British designer William Morris and drew inspiration from the skilled techniques of the Arts and Crafts Movement. 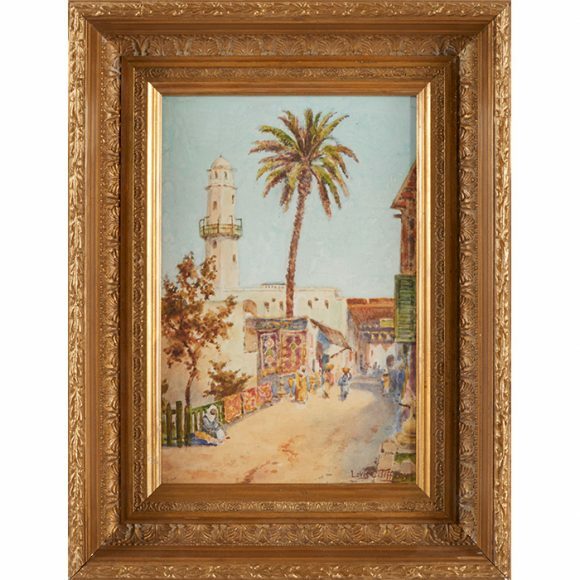 Tiffany’s glasswork was also influenced by his travels to Europe and the Near East. He was critical of the contemporary practice of painting on glass, which he thought marred the innate prismatic qualities of the material. 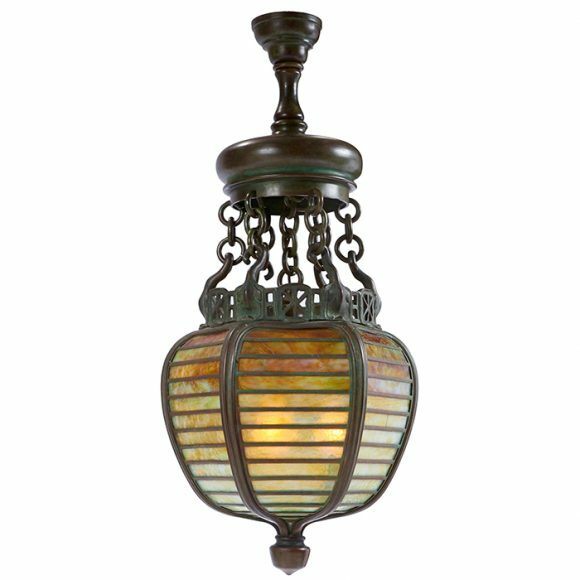 He aspired to increase the potential of the glass itself and created methods that resulted in new, opalescent finishes. His experiments also resulted in the creation of lava glass and his most important innovation, Favrile glass. 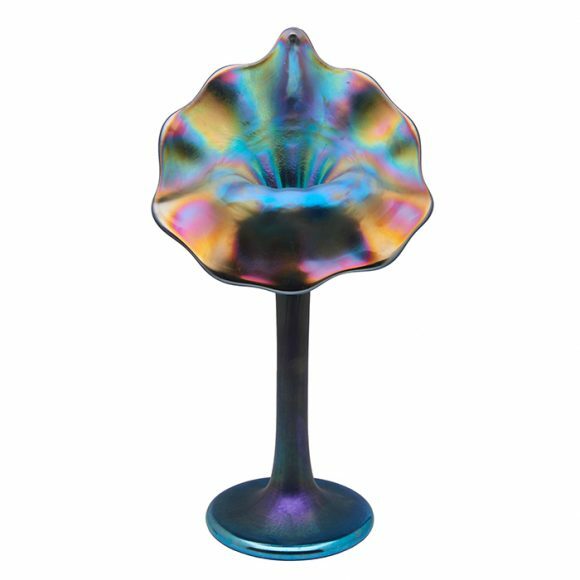 Favrile glass is a type of iridescent art glass and was patented by Tiffany in 1894. It was first produced for manufacture in 1896. “Favrile” is a term that was coined by Tiffany, originating from the Latin word “fabrilis,” or handmade. 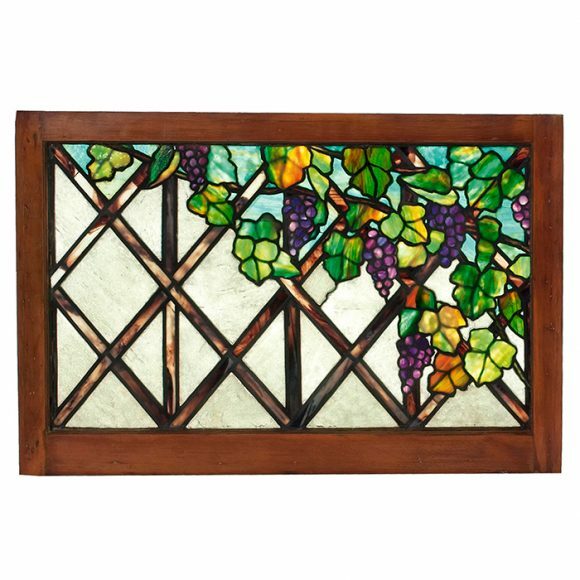 By 1896, Tiffany had opened a new glass factory in Queens and began selling Favrile windows, lamps, vases, and mosaics in America and in Europe. 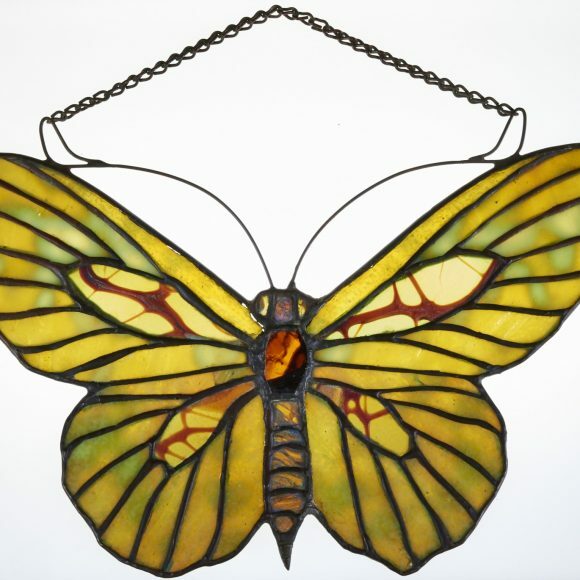 Louis C. Tiffany and Associated Artists was founded in 1879, the first of several of Tiffany’s artistic partnerships. An impeccable taskmaster, Tiffany was known to walk down production lines with his cane and shatter any piece of work that he deemed unsuitable. Tiffany was likewise a consummate marketer, and he would cease production of any item that did not sell within the year. 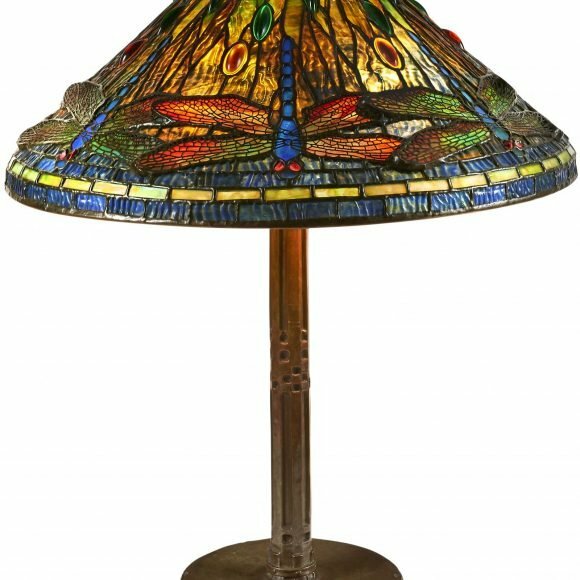 As a primary proponent of Art Nouveau in America, Tiffany maintained the movement’s aim of developing a new aesthetic centered in nature. Tiffany aspired to present the variegated colors and forms of the natural world in a more straightforward, impressionistic manner. Tiffany worked on more residential, municipal, and church interiors than was previously thought. One of his largest commissions was for the residence of Louisine and Henry Osborne Havemeyer. Their house glowed with prismatic glass: mosaic walls, Eastern-influenced lighting fixtures, complex filigreed handrails and fireplace screens, and an enormous suspended staircase. 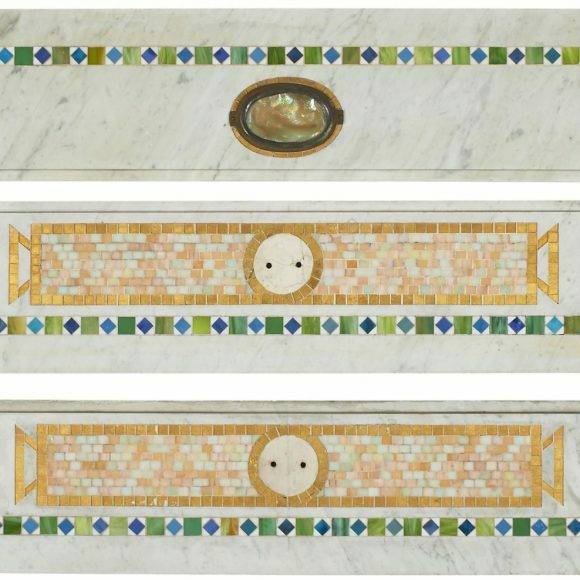 Tiffany designed most of the decorative elements, establishing a stunning cohesion for the residence. 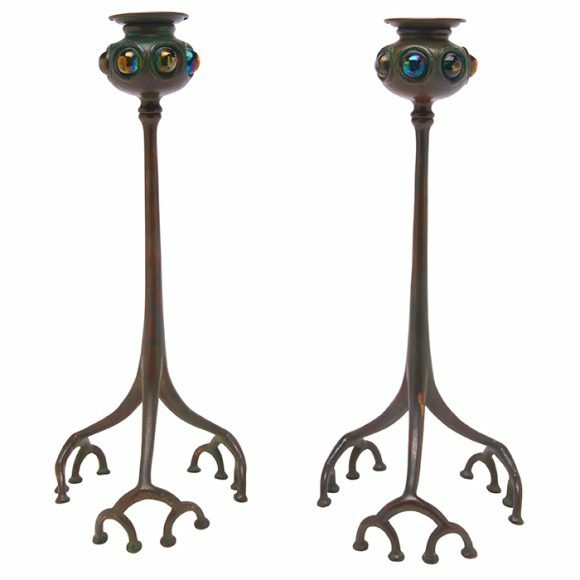 After World War I, cultural trends moved away from Art Nouveau and toward the more minimal, Bauhaus style. This resulted in a significant loss of income for Tiffany’s enterprises. Combined with his lavish, indulgent lifestyle and the cost of maintaining his charitable foundation, Tiffany Studios declared bankruptcy in 1932. On January 17, 1933, Tiffany died in New York in relative obscurity. Early collections of Tiffany’s glass included the Metropolitan Museum of Art, the Smithsonian Institution, Tokyo’s Imperial Museum, and many other notable museums. His stained-glass windows are still found in many of America’s oldest colleges and universities, including Yale, Harvard, Princeton, Columbia, Brown, Vassar, and Wellesley. His works also remain on display in the Smithsonian and at the Art Institute of Chicago.